Comment: As a colorless crystal-opal this 1.75 has earned the right to be called a 'water-opal' but the necessary glass-like body of the latter is too crowded by its play-of-color, which is so dense and easily activated that the body appears slightly yellow tinted, or perhaps is tinted. 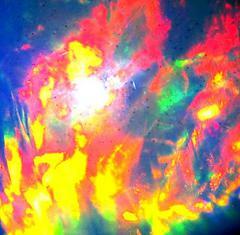 Study the images: Most remarkably is red in green, yellow next to blue, fiery orange side-by-side with green and so on. 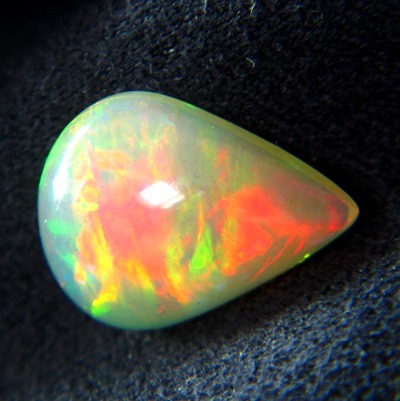 If you have never studied such an opal, you cannot imagine until you see with your own eyes. Beware though, once tasted, enslaved forever. 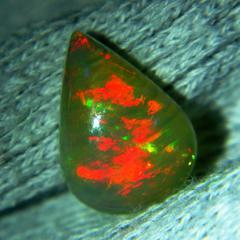 If you dare the addiction, better get start now while Welo opals are affordable, but prices are already going up. Anything remotely attractive from Australia, even as doublet, costs fortunes today. See the side-image, very flat = huge body 12x8mm from less than two carats and still such an intense play-of-color, even in the sideview. Close-up into an multi-million dollar Pollock or Rothko included. 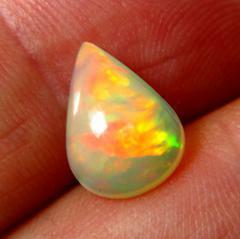 As mentioned elsewhere, in opals carat weight is not the main value driver, once we have crossed into pendant sizes. IGI report, WLT purchase, NhRP donation, free shipping, and other WildFish extras are included in our prices.